In this day and age where things are done with innovation and superb functionality, you can’t feed your cat in the old way anymore. Manual feeding does not cut it anymore because it has a number of problems associated with it. Technology has provided the solution through the use of automatic cat feeders. Automatic cat feeders are designed to make life easy for you and your feline. It works by improving your relationship and ultimately help you have the healthiest cat you can have. Feeding the cat does not have to be on your to-do list anymore. Automatic cat feeders come in different shapes, sizes, and functions. Some are simple, smart or advanced all with the same goal of helping you meet the nutritional daily needs of your cat. Portion control, consistent and timely feeding are all factors that inform the use of automatic cat feeder for any cat parent. Below you will find more than a few that you will be eager to try. 9.1" x 9.4" x 13.8"
13.77" x 15.33" x 8.66"
12.6" x 9.4" x 8.3"
18.5" x 8.7" x 12.4"
11" x 10" x 10"
13.7" x 9.8" x 15.3"
10.4" x 7.4" x 17.3"
16" x 9.5" x 14"
15.7" x 9.6" x 6.4"
It has a timer that allows you to adjust the feeding time based on schedule or when necessary. Power is supplied by 4 alkaline batteries that can be replaced as often as possible. A ‘day” button shows you the number of days left for the remaining food to be used up. This gives you enough notice to get more food ready in advance, therefore you are always prepared. It can dispense up to 5 cups of food at a time. There are two color options for this automatic feeder, this grey or black. Remove all foods after turning off the distributor before you can clean. Use a soft brush, then on the dispenser. 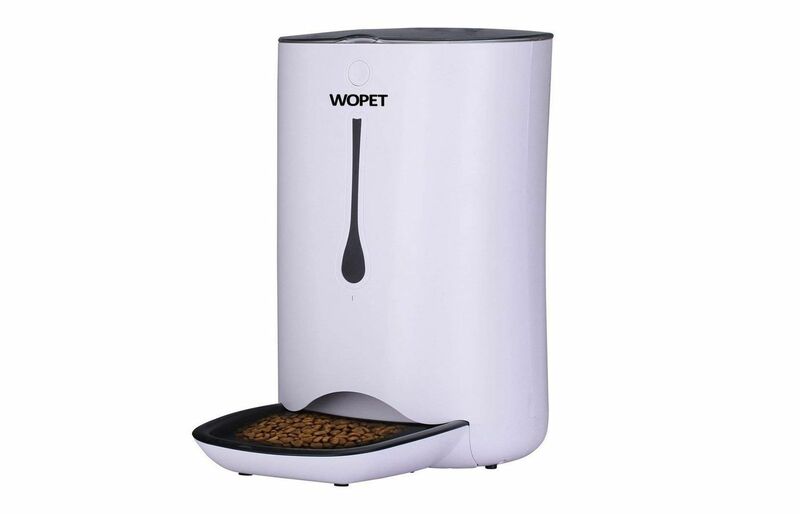 This is also for dry cat food, a white reliable automatic cat feeder that has a 6L capacity. It can dish out up to 39 portions for every meal, all depends on your settings. The feeder is made of ABS material and comes with a manual, a USB cable and extra rotor. The LCD screen displays time and meal sizes. This feeder has five-star ratings from all purchasers so far. The rotor are of varying sizes, the large one dispenses a portion of meal that is about 12g while the smaller rotor dispenses food portion of about 5g. So, you can interchange both rotor as needed. The food tray can be removed and cleaned with water. This feeder has a transparent lid that allows you see the quantity of food left in the feeder from time to time. In addition, the lid clicks and lock ensuring an airtight container which prevents food from going stale. 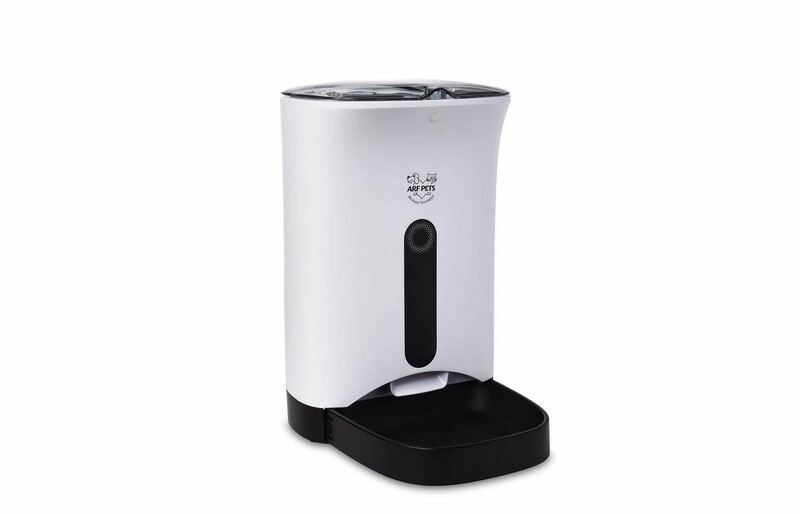 This is a 3L capacity automatic feeder that dispenses 4 scheduled meal in a day, following the breakfast, lunch, dinner and a snack meal pattern. It has an infrared induction system that prevents the food spilling or jamming. The sensor stops the food from filling beyond a certain limit. You can still call your cats to eat using the inbuilt voice recorder and speaker to talk to your feline for ten seconds. If you have an adapter problem, you have the use of batteries as a backup. Although the automatic cat feeder is white in color, the lid is not transparent. This is designed so to prevent the cat from pawing his way through to get to the food. 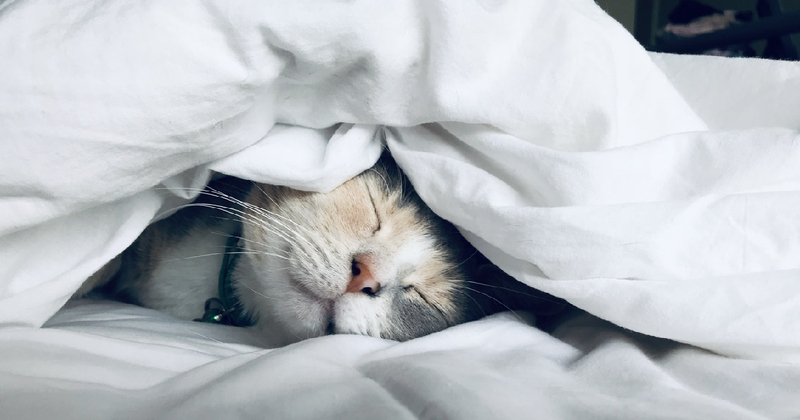 In addition, the recorded sound is low so as not to wake up the whole house, but high enough for your cat to hear when it plays. Use a damp cloth to clean as needed. 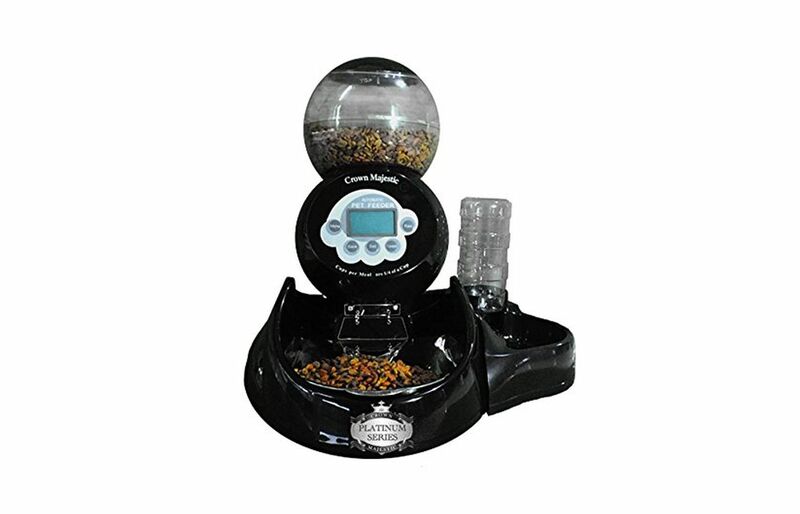 This is a large capacity black automatic cat feeder. It uses a conveyor belt to dispense food according to your preferred schedule and portion size. 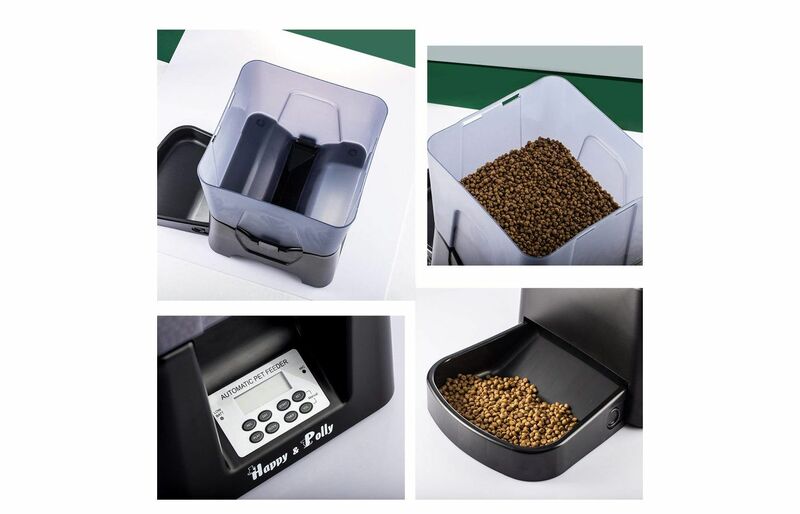 Unlike most automatic cat feeder, this Healthy Pet Simple feed automatic cat feeder allows you to use both dry cat food and semi-moist cat food. 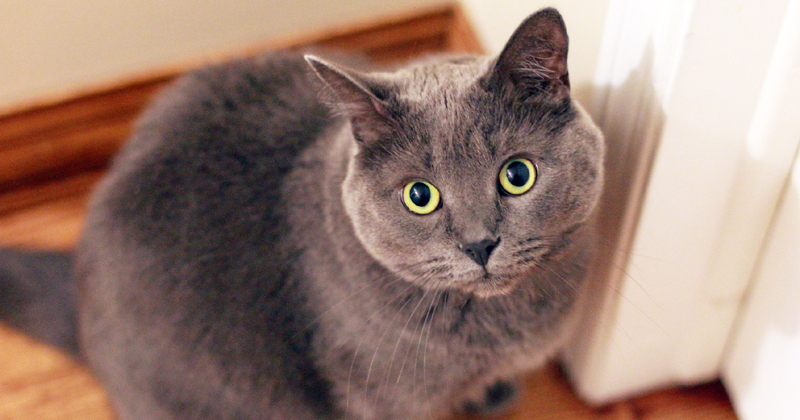 This characteristic gives your cat a wide variety of food choices. Each portion size can range from 1/8 to 4 cups for up to 12 meals daily. The feeder has a total capacity of 24 cups of food. It is recommended you follow the instructions in the manual for setting up meal times. Furthermore, it has a Slow Feed option that dispenses meals as scheduled in bite sizes across a 15 minute period. This system helps prevent your cat gulping down large chunks of food, vomiting and eliminates any form of bloating. It comes with a stainless steel bowl that can be easily washed in a dishwasher and help you maintain good hygiene. Also, because of the weight of the feeder, it cannot be tipped over by a rambunctious cat. The magnetic lock lid ensures the food does not get stale or get broken in by a hungry cat who doesn’t have the patience to wait for the next meal. This automatic feeder works only with dry meals. Also, you can use the Dc power cable on any power outlet or simple used 3 D batteries. Your cat can still enjoy hearing you call him to eat through the built-in recorder that allows you to be a part of your furries meal time. 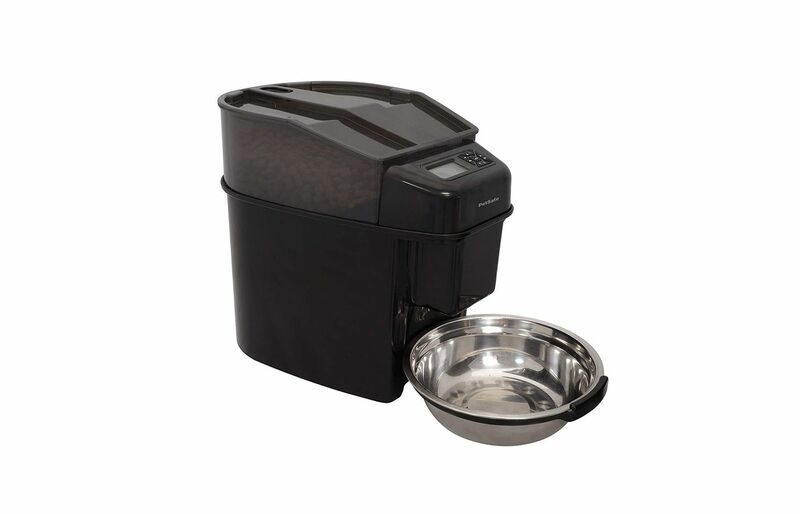 The Crown Majestic Automatic cat feeder is a black machine with a lot of curved edges. It is quite simple to program, has 4 times scheduled meal option per day. The portion of food dispenses in the following ration: 1/8, ¼, ½, ¾, or 1 cup. Simply choose the most suitable for your cat. This flexibility makes it easy to feed kittens, nursing cats or the elderly felines. 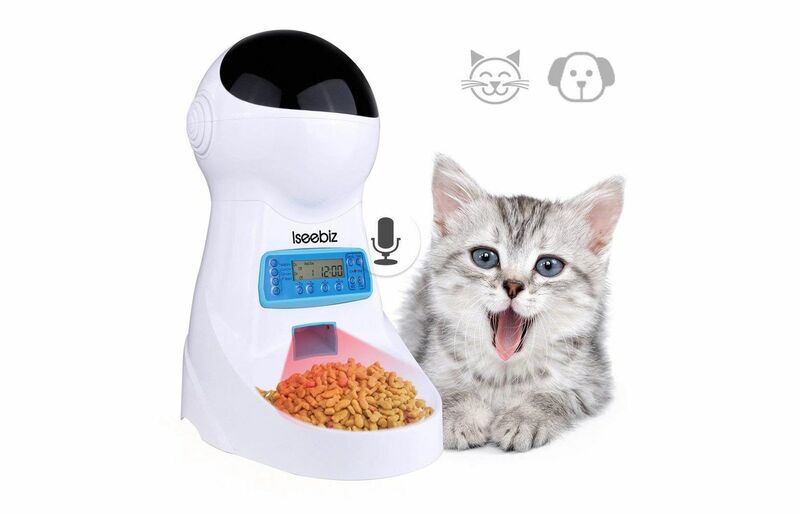 It can dispense any type of dry kibble that your cat eats, use the 12 seconds voice message to call your cat to feed. This automatic feeder also features a water dispenser alongside the food dispenser using one unit. If you don’t want to use the water dispenser, you can leave it out and it will not affect the function of the food dispenser. Other parts of this 4.4L automatic cat feeder are the detachable stainless feeding bowl, water dispenser, chute protective guard, a replaceable impeller. Furthermore, you should set the Cup size adjuster to fit the type of kibble you want to feed your beloved cat. This neutral white automatic feeder can hold 20 cups of food. It is designed for dry cat food and as such can be set to dispense from two teaspoons of food up to four and a half cups per meal. It has two compartments, the main and the inner. The inner compartment can be removed along with the plastic feeding tray and washed in a dishwasher. You can schedule 4 meals per day for your feline. Although it has a power adapter, you don’t have to worry about your cat missing a meal when there is a power outage, because 3 D-size batteries will help it function without any hitch. It also has a USB cable and an instruction manual detailing how to install the large food dispenser. 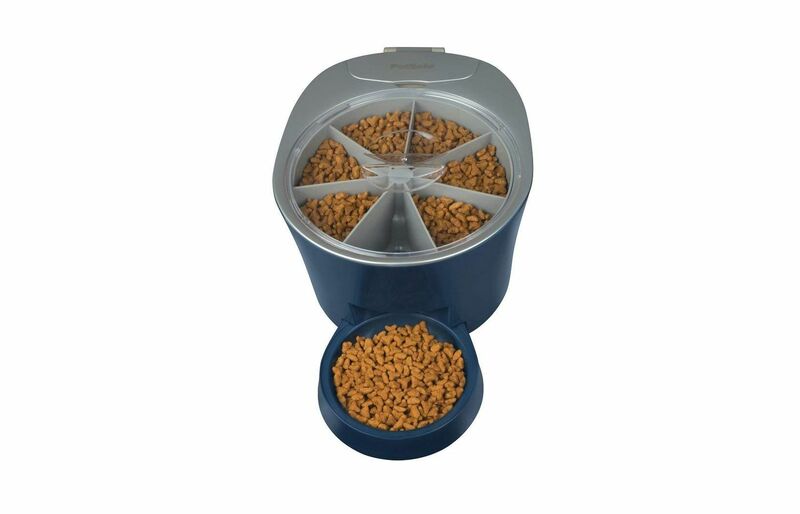 The small and large dispenser can be used based on the size of the food you are feeding your cat. There is also a voice recording feature as well. 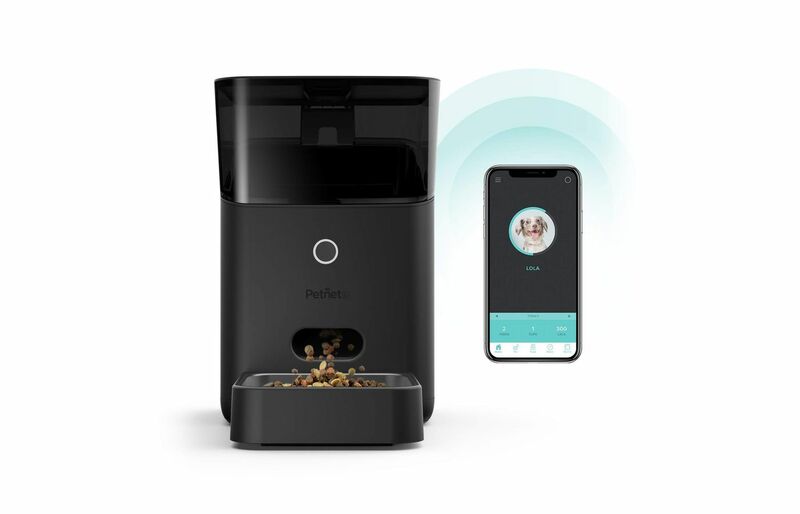 With this automatic cat feeder, you can feed your cat both remotely and right on time using an APP. The App is compatible with any smartphone with the ios or android system. 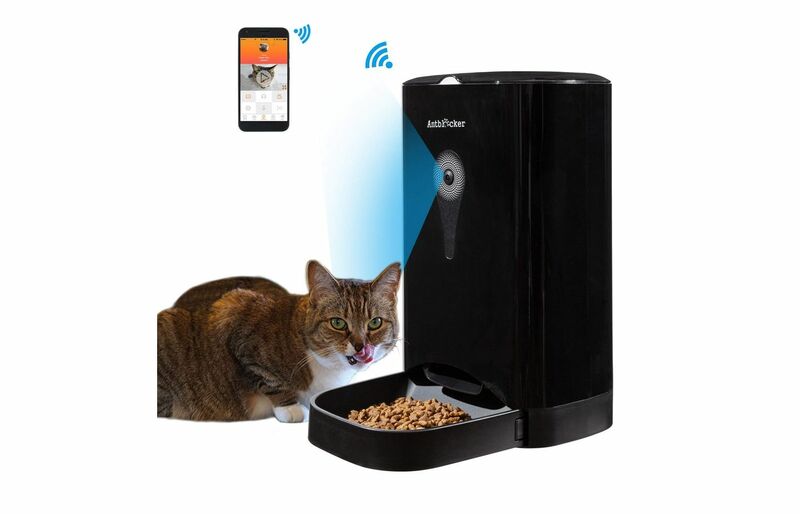 Furthermore, it has a video monitor and audio communication that allows you to see your cat, listen, observe and talk to it. It is like you are back at home as of you never left. The camera has a 130-degree visible angle of high definition. This is particularly ideal if you have kittens that need to be monitored closely or an ailing cat that needs coaxing to eat. The feeder also supports a 128G TF card that allows you to store videos and pictures of your feline beauty. The feeder supports up to 10 portions per meal and four meal per day. You can still program the feeder to work even when you are offline. This white kit is a 4.5L capacity and is fitted with a removable food tray. Like many other activities we do from our smartphone, this automatic feeder can be controlled from your smartphone. This allows for flexibility and freedom to use anytime and anywhere. However, you will require a wireless router of 2.4 GHz. There is also a Petnet App that allows you to get a customized portion recommendation for your feline. 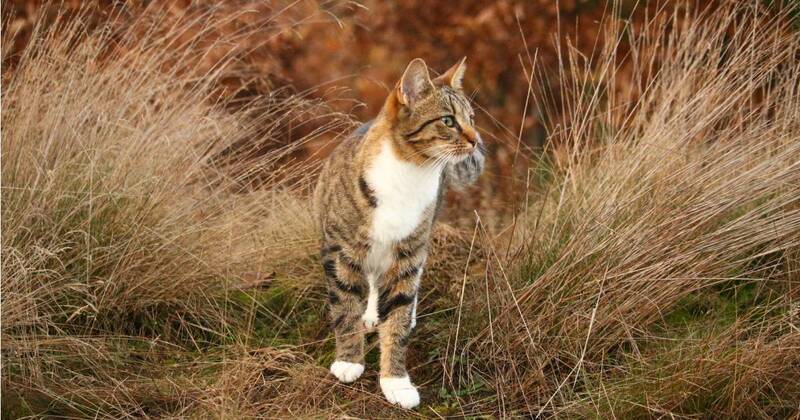 All you need to do is specify the cat’s weight, age, and breed and activity level. Furthermore, you receive timely alert notification when your cat has been fed. 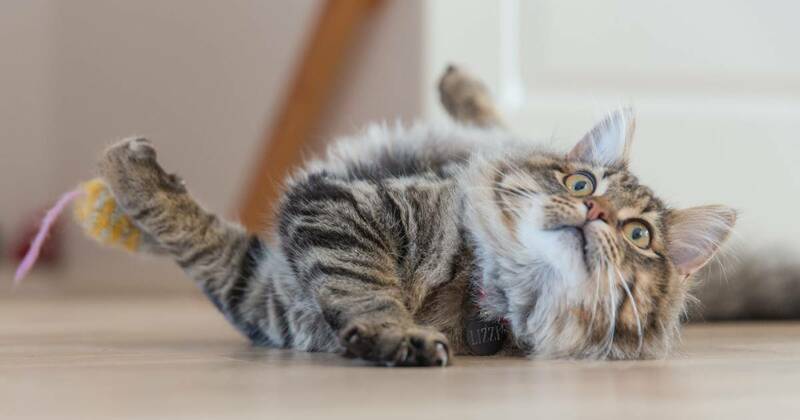 You can also connect to Amazon Alexa, Google Assistant and Nest Cam that allows you to get updates of when your cat ate, snapshots of your feline eating and information on the quantity of food left. No wonder this automatic cat feeder has a 5-star rating. It uses one lithium ion battery which is included in the purchase. Most importantly, it has inbuilt batteries that serve as a backup and can supply power for up to 2 days. Also, the USB cable is chew resistant. It is dishwasher friendly therefore making it easy to clean. Other features include Pet-proof self-locking lid, food container lock, food level sensor, and a removable food container. You can feed your cat dry kibble or semi-moist food. Both carousel and food bowl can be removed and washed in the dishwasher. It uses 4 D-cell alkaline batteries. Also, it has a pet-proof lid that you can see through which ensures your cat can’t break in to steal food. You can also use the feed now option just with a touch of a button to make food available for your cats immediately. 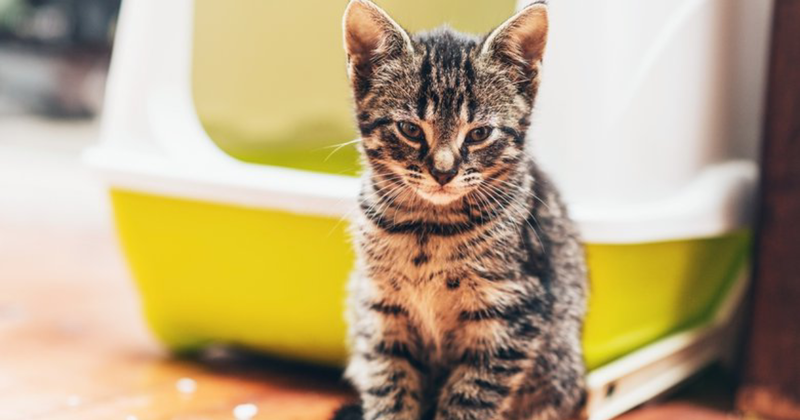 When is it necessary to by an automatic cat feeder? When you have a cat that is dealing with obesity and suffering from the consequences of being overweight. You just need to control the portion size of each feeding time. Also when you have to be away from home and unfortunately have no one to help babysit your cat. If you are usually late getting home from work and have a spontaneous job that have erratic hours, then you need a cat feeder. 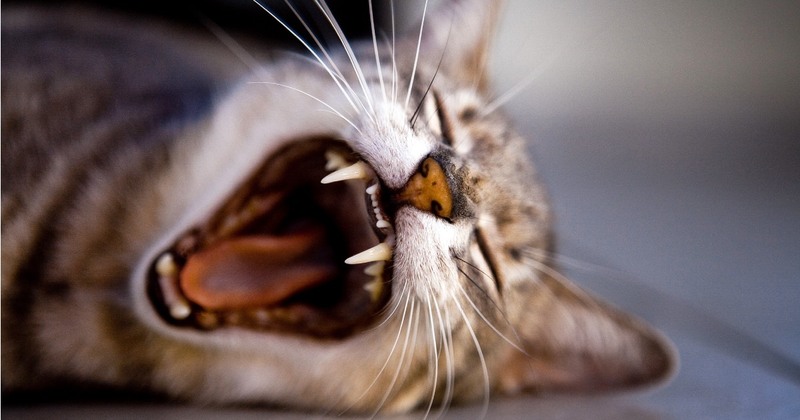 Finally, if you have a spoilt cat that can cry you awake at dawn because he needs to eat. 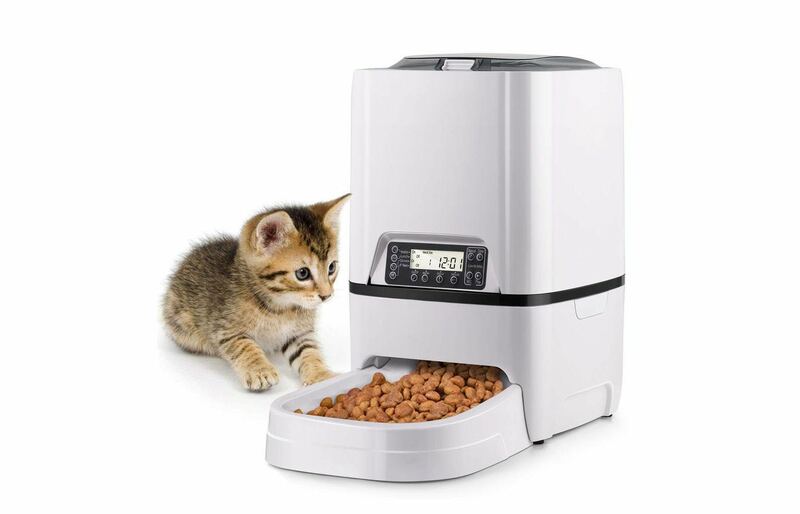 Don’t suffer anymore sleep interruptions with an automatic cat feeder. Where are the important features of an automatic cat feeder? Apart from the fact that it should automatically dispense food for your cat, a good automatic cat feeder should have a backup power source. There is no good investing in a feeder that does not have an alternative power source. So, if it has a power cable, it should be able to work with batteries. Also, it should allow you the flexibility of setting portion sizes and feeding times. Next, because cats are fickle and deft with their paws, you should look for feeders with great lock lids or else you might come home to an overfed cat who gorged himself on food. Lastly, look for automatic cat feeders that are designed in a way that allows you access to clean the food compartment, tray or bowl. It is important to maintain good hygiene so as to keep your cat healthy. 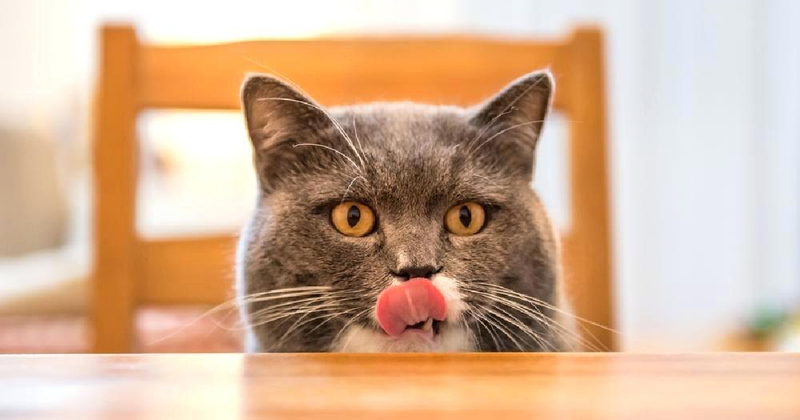 It will be fatal to feed your cat bacteria infested meals.